The Folk Choir: We Raised the Roof! Congratulations to everyone who sang at the Raise The Roof concert, at the West End Uniting Church on Saturday 11 October. What a fabulous concert in a gorgeous venue, and The Folk Choir nearly took the tiles off with "Unison In Harmony", including that great line, "raise the rafters, we don't care if the roof's beyond repair"! 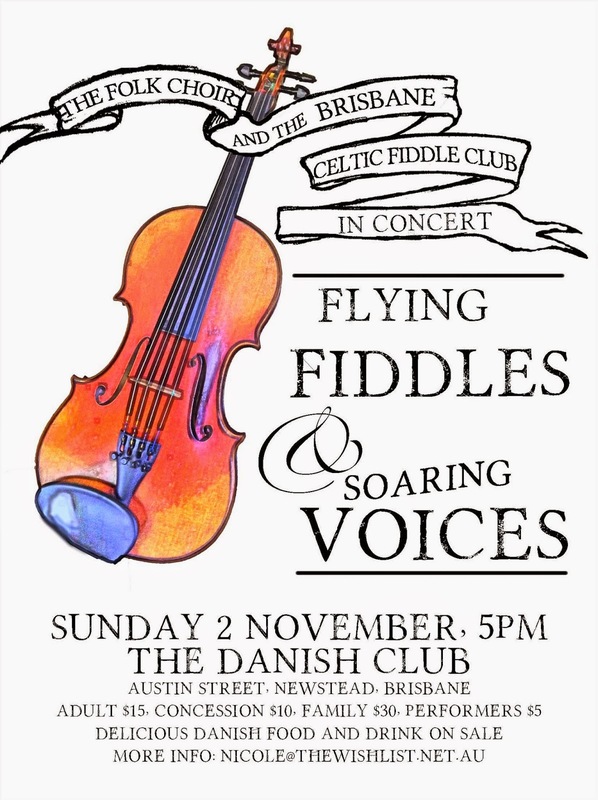 Now the excitement of being part of the West End Festival has settled, we're getting excited about two new projects, our concert with the Brisbane Celtic Fiddle Club on 2 November (poster below), and our participation in the community choir Peer Sing on 8 November. Please tell everyone you know about the Flying Fiddles and Soaring Voices concert on 2 November at the Danish Club, it will be wonderful. The Folk Choir is singing every Thursday (EXCEPT 13 NOV, WHEN G20 IS ON) until 11 December, so come and have a sing!